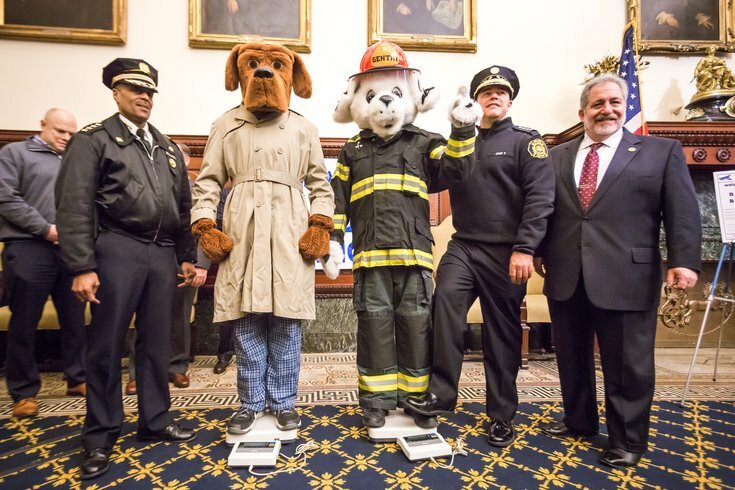 Police Commissioner Richard, J. Ross, Jr., left, Fire Commissioner Adam Thiel, (second from right), their department's mascots, 'McGruff, The Crime Dog', and 'Gentry' pose with the vice president of Weight Watchers of Philadelphia, Inc., John Birnhak, right, during the ceremonial weigh-in of the 31st Weight Watchers Battle of the Badges, Friday, March 24, 2017. 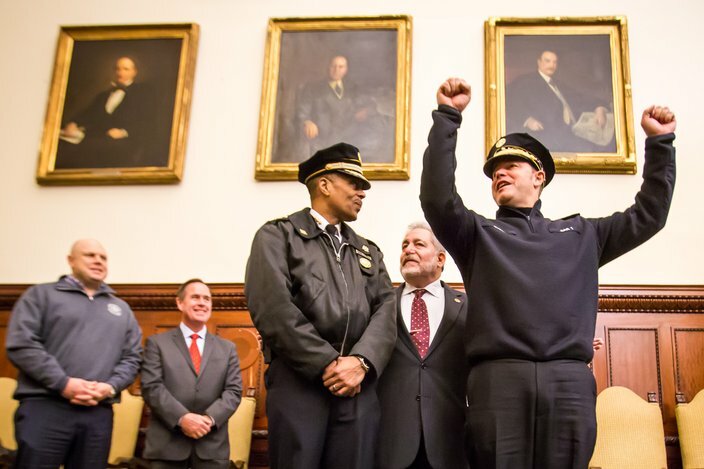 Fire Commissioner Adam Thiel and Police Commissioner Richard Ross stepped on scales Friday morning at City Hall for the ceremonial “weigh-in,” kicking off the 13-week competition. Philadelphia Fire Commissioner Adam Thiel, right, pretends to be the winner while standing on a scale next to Philadelphia Police Commissioner Richard, J. Ross, Jr., during the ceremonial weigh-in of the 31st Weight Watchers Battle of the Badges, Friday, March 24, 2017. The department with the highest average weight loss will claim the trophy and victory banner and the Hero Thrill Show – the police and firefighters’ children’s charity – will receive a $10,000 donation from Weight Watchers of Philadelphia in the name of the winning department. 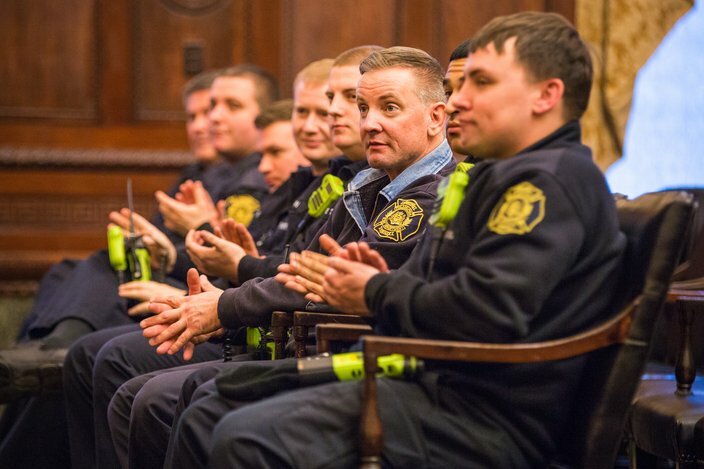 Philadelphia firefighters attended the ceremonial weigh-in at City Hall of the 31st Weight Watchers Battle of the Badges, Friday, March 24, 2017. “Can’t say enough about our partnership, even though we’re going to kick your butts,” joked Ross. “Nah, really. This is a nice competition and an opportunity to get in shape and lose needed weight so we can get through these stressful jobs each and every day. 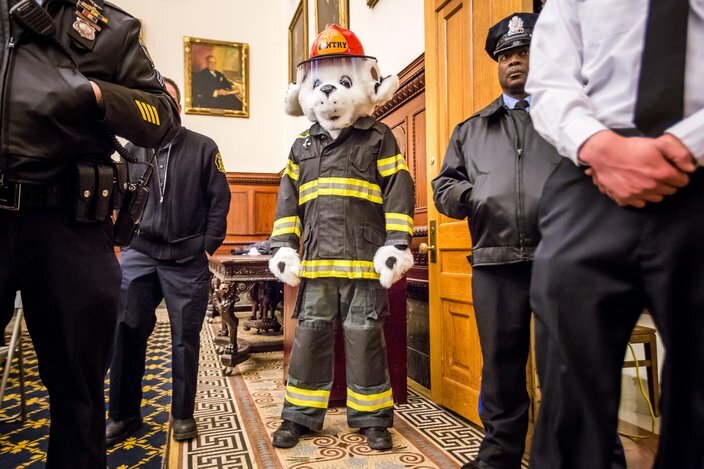 The Philadelphia Fire Department's mascot, Gentry, looks on during the official weigh-in ceremony, Friday, March 24, 2017, at City Hall. According to John Birnhak, vice president of Weight Watchers of Philadelphia, the departments will enter this year’s battle all tied at 15 wins each in the overall standings. Throughout the past three decades, the combined total weight-loss for both departments is 192,215 lbs. The annual “Battle of the Badges” motivates the city’s two uniformed departments to shed some extra pounds at the start of spring and jumpstart some friendly competition for a good cause. “That trophy is gonna look great in my office,” said Thiel.